We love these crepes. They are made with 100% buckwheat flour and no dairy. They can be served with savory ingredients for dinner, or enjoyed for breakfast with fruit and maple syrup, or with cottage cheese or yoghurt. They are pictured here with a drizzle of kefir and warmed frozen berries. 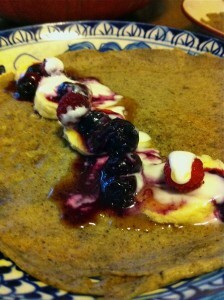 When we are finished making the crepes, we pour the frozen berries right into the warm cast iron pan for a few minutes. Beat the eggs and mix in the rest of the liquids. Then whisk in the flour and salt slowly to avoid clumps. Warm pan or griddle on medium heat (we like using two cast iron pans) and grease with olive oil or butter. When warm, ladle about 1/4 cup of the batter into the pan, quickly swirling the batter to cover the bottom or at least mostly cover the bottom with a thin layer. Adjust the amount you ladle into the pan so as to just cover the bottom with a thin layer. Flip the crepe after about 3-4 minutes, or when the edges look cooked through and if you peak underneath the crepe is golden brown. It should take a couple minutes on the second side for the crepe to become golden brown. Optionally, warm the oven to the lowest temperature, stick a plate in there and pile them on to keep the warm till you are ready to eat.